Charcoal that produces properly is a fuel and provides heat! Wood adds flavor! There are so many methods of getting a message out rapidly given the speed of technology and the many platforms for posting opinions and marketing strategies today. In doing research for a publication, I came across a statement made by a charcoal company that made me a bit … confused. This company claimed that their charcoal product was an ingredient, not a fuel! Not a fuel? That statement is in direct conflict to what charcoal manufacture was designed for – heat. I realize that when used with 100% accuracy, charcoal will produce no smoke and a consistent heat. We all know that the 100% accuracy is the kicker – pretty much no one is proficient at producing full ignition of the charcoal with stable air intake to maintain the high heat level the product was designed for. What usually occurs is that we start out with full ignition but given the need for longer cooks, we add charcoal and thus, start to fluctuate the oxygen feed. Only during those fluctuations does the production of smoke occur with charcoal. Charcoal production is the act of carbonizing wood which means all the volatiles of the wood is burned off until what is left is pure carbon or at least a high percentage of carbon. There is no refuting that charcoal burns cleaner, hotter, and more evenly than wood only. Here are where differences occur though when it comes to types of charcoal. Lump charcoal is made from various scrap wood sources like furniture manufacture, a wood packaging manufacturer, the flooring manufacturer, and building material scraps. Due to the high level of variation in these pieces, most often there is not 100% carbonization of the lump charcoal production. That’s why you can get some smoke and flavor from that product; when combustion of a non-charred piece occurs, you’ll stimulate organic compounds that produce flavor. Keep in mind, because scrap wood is used you can get other debris in the purchased bag as often this is scooped up from a site and transferred to a production facility, with the scoop gathering anything that may be in the area. Traditional charcoal manufacture also known as briquets is also made from scrap wood, sawdust and wood chip product. It is known that some manufacturers include a percentage of softwood but for the most part, the product is derived from hardwood. Briquets do have binders added and there are some types that have accelerants added to make them extremely quick to lite. Personally, I can detect those additives and feel they do change the overall flavor when cooking foods over them but you can make that determination for yourself. Controlled flavor only comes from wood and the best and safest flavors, from hardwood. 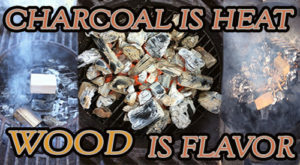 Charcoal is a fuel, it is for heat, and the only flavor it produces is when meat/poultry drippings fall directly on the hot coals and vaporize, stimulating flavors. Never are flavors stimulated from the briquet or charcoal. So, Who Is The Ingredient? If the definition of an ingredient is a substance that contributes or makes up a mixture, then truly hardwood is an ingredient in wood-fired cooking recipes as it gives off its distinct organic flavor compounds that make up the cell structures. Heat is NOT an ingredient and that is what charcoal is: HEAT! A claim to be an ingredient just holds no truth. Did you find this post informative? Leave a comment or suggestion as we’d love to hear from you so we can bring the information you’re looking for. And don’t forget, follow us and subscribe so you don’t miss a thing! Dr. 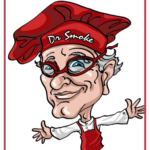 Smoke Charcoal needs to be supplemented by Smokinlicious wood products!